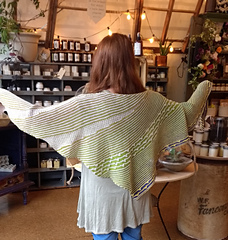 This lovely shawl is the April KAL on the Wolle’s Yarn Creations Group. 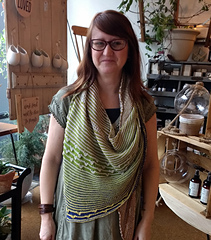 The KAL starts April 15th and the full pattern will be sent to you then. Please join us for all the fun! 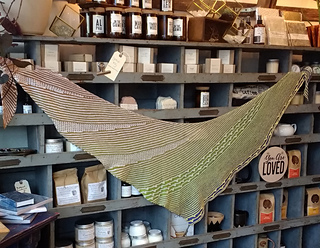 Harriet is the perfect shawl for using up 2 different skeins of color changing yarn. 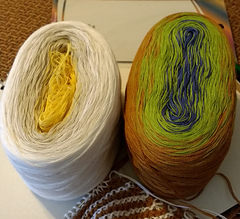 You’ll need 2 very different 480 yard colorways (see photos and yes, the sample was really worked with these 2 skeins!) and size 5 needles of varying lengths. I recommend sizes 16”, 24” & 40” to accomodate her as she grows! Harriet is big. Really big! She measures approx. 90” x 62” so there’s plenty of her to wrap up in!!!! This is a fun knit that will take you beyond the endless garter and lace shawls that are so prevelent today. Intrepid beginner and up due to K2togtbl and some intense increases.